Office — Northern Acrylics, Inc.
Dimensions: 9.50" W x 11.75" H x 4.50" D Dim. O.D. Promote and sell your product with this clean, contemporary literature holder. Accommodates 8.50" x 11.00" sheets. Great for trade shows, exhibits, point of purchase. Constructed from 3/16" and 1/4" clear acrylic. Custom sizes too. 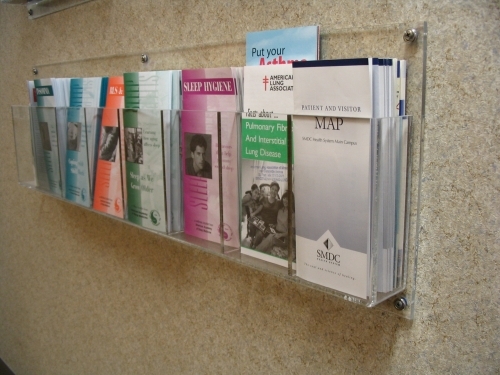 Desk Top literature display with graphic sleeve and combination card pocket. Constructed from 3/16" and 1/8" clear acrylic. Sample shown has reversed 3 color logo for brand recognition. Brochure holder and pocket have polished edges. Dimensions: 8.50" W x 11.00" H x 4.00" D Dim I.D. Great for retail, used throughout: counter promotions, sale items, point of purchase. Constructed from 1/8" clear acrylic, machine-bullnosed edges, clear non-skid feet on base to prevent sliding. Many sizes available. Nice quality sign holder. Dimensions: 8.50" W x 11.125" H x 4.00" base Dim. I.D. Great for promotions, product information, sale items. This unit has a 4" brochure pocket for promoting your products. 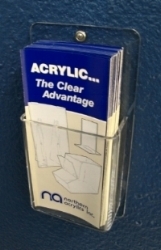 We can manufacture just about any size of this holder, including different sized brochure pockets. Dimensions: 5.00" W x 10.25" H x 4.25" D Dim. O.D. Table top brochure holder has a secure steady base. Constructed from 3/16" and 1/8" clear acrylic. Pocket is 4.25" wide x 6.00" tallx1.25" depth. Polished edges, w/ clear non-skid feet on base. Dimensions: 4.437” W x 3.00” H x 2.75” D Dim. O.D. Clear or blue acrylic business card holder or cell phone holder. Holds a 1" stack of business cards or one cell phone. Laser cut; machine polished edges. Wall mounted 8.50" x11.00" sign holder. Popular in hallways, elevators, for promoting literature on retail items. Polished edges, w/ adhesive tape on back surface. We can provide nearly any size of this item, depending on your needs. We fabricate a variety of wall mounted holders to fit your wall sizes and specific needs. Units can have fixed or movable dividers which can adjusted as your product information changes. Several material choices are available. Dimensions: 5.375" W x 11.00" H x 2.50" D Dim. O.D. Widely used in many areas. Brochures, maps, product demonstration sites. Constructed from heavy 3/16" clear acrylic. Pocket dimensions are: 4.50" wx5.75" tallx2.00 deep. 2-hole mounting, polished edges. Dimensions: 11.00" W x 12.50" H x 2.50" D Dim. O.D. Manufactured from 1/4" clear acrylic. Pocket Dim: 10.00" Wx7.75" Hx2.00" D ( I.D.) dimensions. Machined, polished edges. 4- hole mounting. Key hole hangers for wall mounting. Marker/eraser pocket included. Many sizes available, quotes upon request. Addition of graphic also available. Dimensions: 9.00" W x 5.00" tall / rise x 11.125" D Dim. O.D. Facilitates much better viewing of copy and printed materials. Unit shown works with a standard sheet. 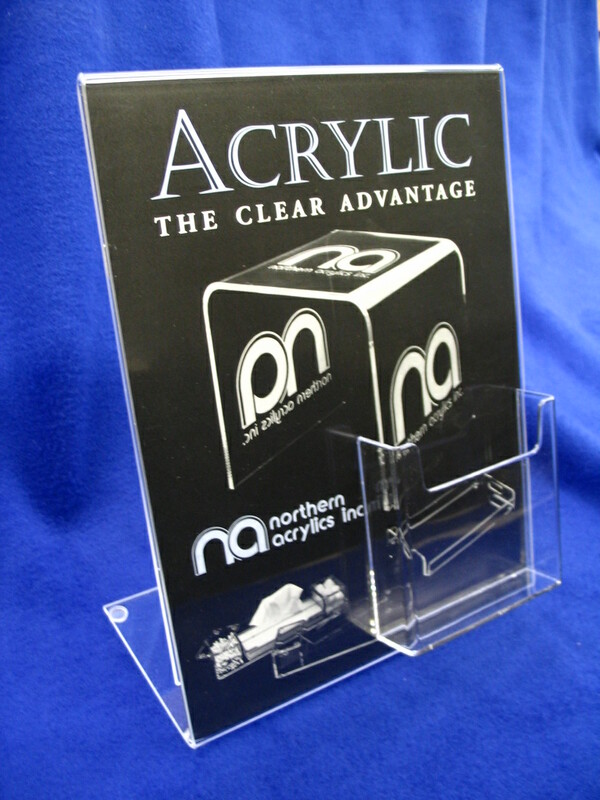 Constructed from 1/4" clear acrylic, clear non-skid feet keep the holder in place. Many sizes ( heights, widths ) can be created. Dimensions: 10.00" W x 6.00" H x 8.00" D Dim. O.D. Our monitor risers can help stop neck strain. Constructed from 1/4" clear acrylic. Unit shown is 6.00" tall. Designed with clear non-skid feet at the base edges. Polished edges. Custom sizes available. Dimensions: 8.00" x 8.00" x 8.00" Dim. O.D. A popular unit for trade shows, drawings, fund raisers, auctions. Can be fabricated in many different sizes and colors. Header card attachments for additional graphics are also an option. Unit shown is 3/16" clear acrylic, comes with 2 keys. 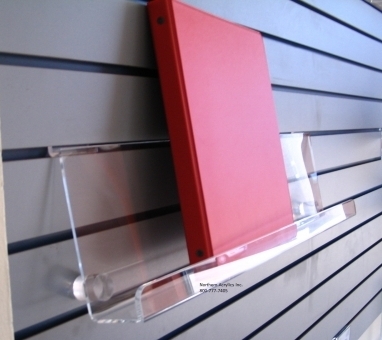 Clear acrylic slat-wall book shelves with 1" stand-off for slanted book display. Dimensions:8.00" W x 4.50" D x 4.25" H Dim. O.D. Display or organize personal items with this high quality shelf. Constructed from 1/4" clear acrylic. Machined and polished edges. Many custom sizes available.